Mega Sale! Free Shipping Included! Save 25% on the Phonelex Cell Phone Signal Booster 2G 3G 4G 850/1900MHz Dual Band AT&T Verizon Sprint Boost High Gain Mobile Amplifier Repeater with Outdoor Omni-Directional and Indoor Panel Antenna Kits by phonelex at All Company Mobiles. Hurry! Limited time offer. Offer valid only while supplies last. Frequency Range: Downlink 824-849MHz/1850-1910MHz, Uplink:869-894MHz/1930-1990MHz Standard Supported : CDMA, WCDMA, GSM, EDGE, TDMA and AMPS etc. 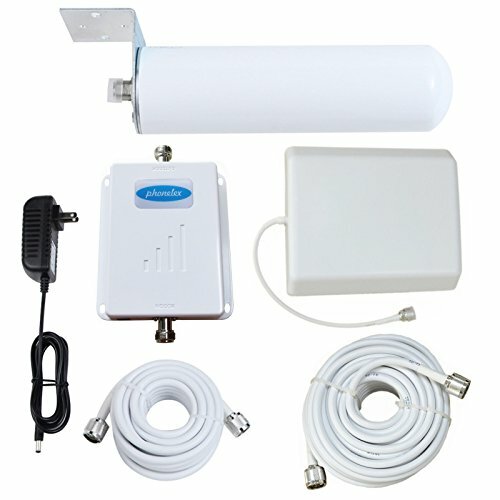 The Cell phone siganl booster kit includes an booster, an indoor antenna and an outdoor antenna, the outdoor antenna can pick up good mobile signal from outside of your house, and send the signal through coaxial cable to the booster, the booster can amplify the signal, then the amplified signal is sent to the indoor antenna, the indoor antenna can transmit the signal into your house, so you can enjoy clearer phone call or faster mobile date inside your house. 1. Check your frequency, because different Phone Providers operate on different frequencies. Usually, 850MHz and 1900MHz are associated with voice and 3G data; while 700MHz and 1700MHz are associated with 4G data. For more detail, refer to wirelessadvisor.com. 2. Make sure that you can make calls outside your house, at roof or wherever you plan to install the Outdoor Antenna. If there is no signal outside your house, the cell phone signal boster booster will not work for you. Manufacturer 2-year warranty and 30-day money-back guarantee.very easy to install !